Every year, large amounts of organic wastes head to the landfills, taking up extraordinary amounts of space and creating methane off-gas. It is estimated that about 60% of a household’s waste is organic. In Australia in 2006-2007, 13.6 million tonnes of organic wastes went to landfill (PDF, 880KB). Learning how to make compost decreases the garden’s need for water and fertilisers, improves the soil’s structure, saves money and removes pressures from the landfills. If you do not already have a compost regime, autumn is the perfect time of year to make one. Fallen leaves fulfil the carbon requirement while grass clippings from the end-of-summer yard tidy-up contribute the needed nitrogen. Making compost is the earth’s way of recycling organic waste. To successfully make compost at home, you must remember four ingredients: green, brown, water and air. The correct ratio of each ingredient will ensure healthy, rich compost. Green: Green ingredients drive the nitrogen that provides proteins to the microbes so they can break down and decompose organic waste. Green ingredients include grass clippings, raw food scraps, tea bags and coffee grounds. Do not compost items like meat, dairy or oils. Brown: Brown ingredients build the carbon, which is the compost’s energy source. Brown ingredients can be dead leaves, straw, shredded paper, egg boxes and wood shavings. Water: The compost mixture should be wet to the touch and release one or two drops of water when squeezed without being sodden. Air: Making compost is an aerobic activity; therefore, turning the compost to aerate it will speed up the decomposition process. Where should you put your compost pile? While this seems like a straightforward question, thoughtful consideration is needed to make the decomposing process efficient. Left long enough, any organic waste will break down over time, but speeding up the process is the goal here. The site should have good drainage and should avoid direct sunlight and strong winds as they can dry out and cool the pile. A half-day of sunlight is ideal. The site should be conveniently located so you don’t have to put on your hiking boots just to add kitchen scraps. Make sure that the pile does not come into contact with the house, fence or trees, as the wood will rot. If you live in close proximity to your neighbours, you may want to consider the aesthetics of it. You may view it as a fine, organic work of art; however, your neighbours may see it as something entirely different. You can make it less obvious by planting a vine on a trellis or growing a tall flower garden in front of it. Pile, Bin or the fancy Rotary? Compost can be made in a variety of ways. A compost pile requires very little to get started and is relatively carefree. It requires some physical exertion however, as you have to get in there and give it a good turning over every few weeks. Because compost piles are in direct contact with the earth, they are inviting for great decomposers like worms to make their homes there. An on-the-ground bin keeps all of the organic waste contained and in contact with the earth. The moisture is better regulated and allows for microbes and worms to lend a helping hand. If you have the space, two bins can be ideal – one to pull the ready compost from and the other to add new waste to. The rotary style also keeps the organic waste contained and takes up little space. Additionally, compost can be easily aerated because they turn easily. On the downside, they tend to dry out quickly. Making a compost pile should mimic making lasagne with an ideal size being 1 metre high x 1 metre wide x 1 metre deep. The layers should be relatively thin and even. Begin by placing a layer of brown ingredients such as straw, twigs and leaves on the ground. Top this with 5-10 cm of green materials. Add a thin layer of garden soil followed by another layer of brown ingredients. You can also add a thin layer of manure from animals like cows or horses. This serves as an activator and accelerates the initial heating of the pile. Moisten the layers and continue to layer in this fashion until the pile reaches 1 metre high. Once the height is reached, turn the pile with a fork every one to two weeks bringing the matter in the middle to the outside and the outside matter into the centre of the pile. The pile may steam when turning, indicating that the aerobic microbes are doing their job and decomposition is taking place. For bins and rotary styles, you can forego the lasagne method and simply add equal parts of green and brown matter. Alternatively, keep a “collection” pile of leaves, twigs and trimmings. As you accumulate kitchen scraps, you then have a pile of brown matter ready to go. If you predominantly have kitchen scraps, mix them with shredded paper, cardboard tubes or egg boxes to keep the pile balanced in carbon and nitrogen. With proper heat, aeration, carbon/nitrogen balance and moisture, compost can be ready in as little as six weeks or as long as six months to a year. Compost is ready when it is dark, crumbly and has a sweet, earthy odour. You should not be able to distinguish the original materials in it. Compost can be dug into the garden, used as a potting mix or sprinkled as mulch. If some pieces are too large, use a screen to sift it and return the large pieces back to the pile or bin for further decomposition. 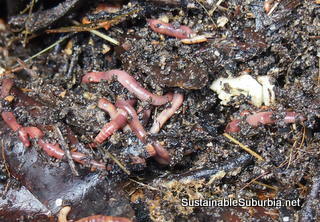 Remember that compost is alive with natural materials and living organisms. Practice good hygiene and wash your hands after handling compost. Wear gloves to protect broken skin.